The Parsi community across India is going to celebrate the Parsi New Year (also known as Pateti and Nowruz) tomorrow, which is 17th August 2018. On this day, people clean their homes, decorate houses with rangoli and flowers, adorn new dresses and visit the Fire Temple to seek blessings from the almighty. What’s Nowruz without feasting on delectable Parsi food along with friends and family, coming together to celebrate the big day? Parsis love their cuisine, which is an interesting mix of hot and sweet food. It involves a mix of simple yet diverse ingredients that make the food extremely special. This Parsi New Year, indulge in a range of amazing Parsi delicacies as we list them out for you. To begin their day with, Parsis generally like their breakfast to have scrambled eggs (called akuri), sev and mithoo dahi (sweet), and Parsi poro – a traditional omelette, made with chilli and coriander. Saas ni Machchi is a unique white curry dish, which is prepared by adding a mixture of egg, sugar and vinegar to it. This mixture is added at the end of the cooking process. You’d need pomfret, black pepper, onions, rice flour and tomatoes among others to make just the perfect fish delicacy. 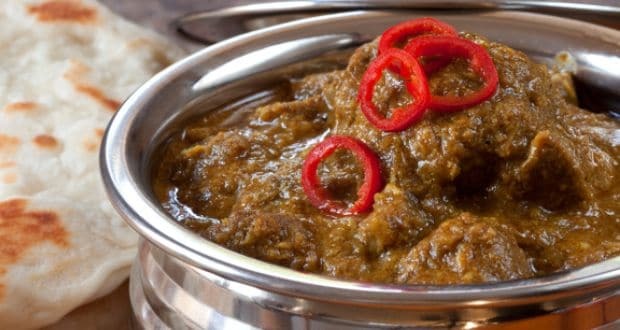 This delicious delicacy comes packed with a curry full of spices along with potatoes that are soaked in salted water and then deep fried to perfection. This dish is generally prepared during the New Year celebration. Parsi dal is a traditional dish often called as dhan dar patio. The word dhan translates to rice and dar means dal. Patio is a fish or prawn preparation that is served with dhan-dar. Vegetarians can avoid adding fish/prawn to make it a pure vegetarian dish. Made using minimal spices, there is a slight inherent sweet taste from the arhar dal itself. Mostly prepared during special occasions like weddings and Nowruz, kid gosht is made with baby lamb, coconut curry and spices. You can have it with roti or steamed rice. Prawns are laced in chilli garlic paste and potatoes smeared with salt and turmeric that are then cooked in a tangy and thick tomato puree. Chicken farcha is a fried chicken appetiser, which is generally eaten as is. Another one is tamota ni ras chawal, which are mutton cutlets with white rice and tomato sauce. Lagan nu custard is one of Parsis most popular desserts. It is basically the Parsi version of the creme brulee and is essentially made with milk, eggs and cardamom. Another sweet is ravo, which is generally enjoyed as breakfast and is made with butter, semolina, milk, cream and sugar – made into a warm porridge. One of the most amazing desserts is mawa ni boi, which is a fish shaped dessert made from ricotta cheese, sugar, cardamom and vanilla. Fish, in the Parsi community symbolises good luck and prosperity. Wishing you all a very happy Parsi New Year!